The impulsive progression in India’s automotive market has captured the attention and focus of the world’s leading automobile and component manufacturers over the last decade. Rising working population & growing middle class are anticipated to remain key growth drivers for automotive industry in the country. Further, government’s initiatives for e-mobility are expected to attract new market players in the Indian automotive industry which is likely to expand the automotive industry growth. There has been a gradual shift in the development of India’s automotive aftermarket. Goldstein Research has commenced several recent projects to help automotive industry players to adopt and develop the precise strategies to effectively capture the India aftermarket opportunities. Further, India is developing as global hub for auto component sourcing and its geographical location has provided the advantage to expand its export base to South East Asian countries and Middle East & Africa region. However, presence of large number of unorganized market players is eh key factor for the stagnant automotive aftermarket growth. India is the largest tractors market and second largest two wheelers market which holds the largest growth opportunities for the market players. Automotive aftermarket revenue of India region accounted for approximately USD 14.2 billion in 2017 or about 8.0% of total Asia Pacific automotive aftermarket industry revenues. Further, the automotive aftermarket industry is likely to expand at a CAGR of 7.6% over the forecast period i.e.2017-2025. Based on the after-market products and services, wear-and-tear parts accounted for the largest revenue share of more than 61% in automotive aftermarket industry. On the other hand, services segment is the fastest growing segment which is likely to expand at a CAGR of +9% over the forecast period. The report covers the present ground scenario and the future growth prospects of the automotive aftermarket for 2017-2025 along with the market players’ analysis. We calculated the market size and revenue share on the basis of revenue generated from major players in all major countries. India automotive aftermarket market is forecasted on the basis of revenue analysis, product benchmarking and strategic developments of key market players. India Automotive Aftermarket Market Outlook 2017-2025, has been prepared based on an in-depth market analysis from industry experts. The report covers the competitive landscape and current position of major players in the India automotive aftermarket industry space. The report also includes porter’s five force model, SWOT analysis, company profiling, business strategies of market players and their business models. “India Automotive Aftermarket Industry Report” also recognizes value chain analysis to understand the cost differentiation, pricing models to provide competitive advantage to the existing and new entry players. 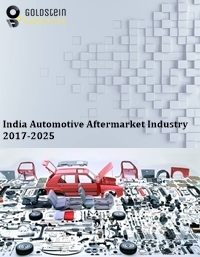 Our India Automotive Aftermarket Industry Report comprises of the following companies as the key players: Tata Auto Component Systems, Minda Industries Limited, 3M, Continental AG, Delphi Automotive PLC, Denso Corporation, Federal-Mogul Corporation, Magneti Marelli S.p.A., Goodyear Tire & Rubber Company, ZF Friedrichshafen AG, COOPER TIRE & RUBBER COMPANY and Robert Bosch GmbH.